This is a 17 x 7 inch flap. Quality flaps protect your inner tube from irregularities on the inside of the wheel. A quality inner tube liner is recommended when replacing tires. Speak to a Tire Expert for assistance with your order. Will this work for a 750-17 tire on a split rim? Yes, this flap is recommended for that application. Hi - I have a 36 Chevy 1/2 ton pickup, low cab w/ 5.50-17 tires on "artillery" rims. Would this flap be appropriate? Thanks. This flap size would be appropriate, however we generally do not recommend any sort of rim liner for a standard steel, artillery type wheel. MY tube has an offset stem. Will this work with an offset stem? 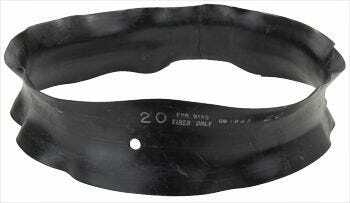 This flap could be made to work if you added an offset hole - but it is equipped with a center valve stem hole.